Getting vaccinated remains the best safeguard for avoiding the flu virus each year. 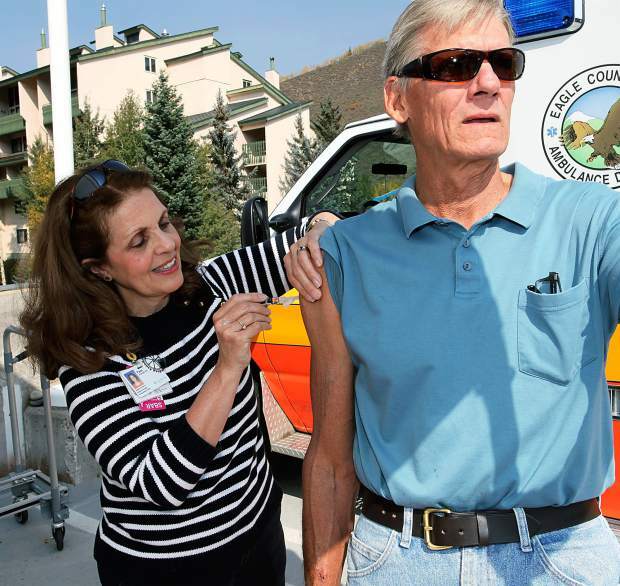 Shots are still available through local clinics, pharmacies and the Summit County Public Health department. There have been just three flu hospitalizations in Summit County so far this season, but the latest from Colorado’s health department shows influenza activity remains on the rise. The flu usually kicks off each October, and this year was no different in the state with the first case confirmed on Oct. 2. The Colorado Department of Health and Environment expects the virus to run its course by May 27, though the most recent reports indicate we still may not have hit this year’s high point. It’s why officials want to offer a reminder that it’s not too late to receive a vaccination in an effort to avoid being laid up in misery. Lopez noted a common hesitation among people who opt not to get an annual flu shot is they believe their immune system is very healthy and they rarely get sick. The problem is, once infected, these individuals can spread it to other, more susceptible or high-risk populations a day before symptoms even arise. Common signs of flu are cough, fever, sore throat, runny or stuffy nose, muscle ache, headache and general fatigue. Diarrhea and vomiting are also indicators, though are more common in children than adults. Serious complications can occur within young children, pregnant women, those with chronic health conditions and the elderly, including death. Determining whether you have contracted the flu is difficult, however, because sometimes symptoms manifest similarly to a common cold, especially the more mild cases. It takes a doctor’s visit to verify with 100-percent certainty, and it is recommended that if you are experiencing symptoms, or are unable to keep down food or drink, to get an appointment as soon as possible so your provider can prescribe an antiviral medication. These treatments can help offset the effects of infection and are most effective when delivered earlier into the illness. That said, annual vaccination persists as the best form of prevention, and the Centers for Disease Control and Prevention reports that the number of illnesses estimated prevented from the flu shot during the 2015-16 season was 5 million. On average, that’s the same amount of people who pass through Denver International Airport in a month. And it is approximated that half that number of medical visits were prevented from people also getting vaccinated as soon as it is available each season. The initial CDC data on this year’s vaccine are also in. The shot is expected to protect 48 percent of those who got one from getting the flu, which makes it about as effective as the prior year’s formula. As a result of the viral strains varying and adapting by the season, different vaccines are produced based on health experts’ best guesses every year. But now with almost 1,800 hospital visits, and counting, across Colorado from this year’s bugs — not surprisingly the bulk occurring in the state’s population cores — and only two-in-five Americans stating they got a flu shot as of early November, there’s still time and reason to get vaccinated today. Precautions like covering coughs and sneezes with a tissue, proficient hand washing and staying home to rest when ill are beneficial in their own right, but science shows the best method for evading influenza during its up to 20-week sequence each year is an annual vaccine.